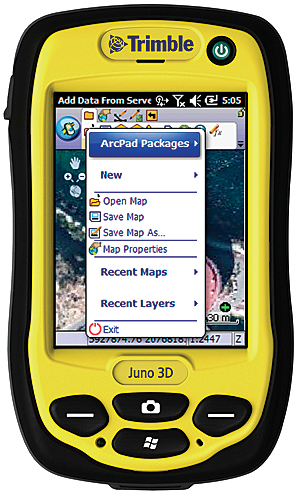 Store ArcPad projects and QuickProject templates in ArcGIS Online for sharing with others (device shown: Trimble Juno 3D). ArcPad 10.2, Esri's mobile mapping and field data collection software designed for GIS professionals, is now available. The latest version connects desktop, online, and mobile workflows in a seamless platform; improves synchronization with ArcGIS; and speeds field data collection with new automation options. ArcPad 10.2 gives users the ability to directly open ArcGIS feature services in ArcPad and synchronize edits with hosted or on-premises GIS. This new capability significantly improves mobile workflows by enabling disconnected editing of published services. In addition, ArcPad gives users the ability to automate edits with a Quick Fields option, which can be customized to autopopulate any field during data collection. For users who rely on desktop workflows that revolve around file sharing and distribution, ArcPad 10.2 includes new ArcGIS Online integration. Users can now store their ArcPad projects and QuickProject templates as an ArcPad package in their ArcGIS Online account for sharing with members of their group. ArcGIS Online subscribers can also browse ArcGIS Online from inside ArcPad to select and download a project or template, creating an easy, collaborative workflow. Existing ArcPad users can download ArcPad 10.2 from the Esri Customer Care site. For more information on what's new and to evaluate ArcPad at no cost, visit esri.com/arcpad.